I retired from the position of Editor-in-Chief of Plant Biotechnology Reports at the end of 2018. It has been 12 years since the late Professor Atsushi Komamine, a global leader in plant biotechnology, and I as cofounding Editors-in-Chief launched the inaugural issue in 2007. After Professor Komamine passed away in 2011, I took on the responsibility alone. In 1993, the Korean Society for Plant Biotechnology (then the Korean Society of Plant Tissue Culture) celebrated the 20th anniversary of its founding by holding the First Asia-Pacific Conference on Plant Cell and Tissue Culture in Daejeon, Korea. In the preparation of the Conference, as Chair of the Scientific Program Committee, I consulted with Professor Komamine on the program. He provided a great help to me, which made us fairly close. Later I reciprocated for his help in his initial establishment and management of the Asia-Pacific Association of Plant Tissue Culture and Biotechnology. In the mid-2000s, I proposed to Professor Komamine the publication of a journal in the framework of the Association. He readily accepted and chose Plant Biotechnology Reports as the title of the journal from among a few candidate titles I had suggested. In the beginning, national correspondents of the Association member countries served as the Editorial Board members. I am very proud of introducing Plant Biotechnology Reports (PBR) as a leading journal in the field of plant biotechnology representing the Asia-Pacific region, as was the original aim. I am also very pleased that Dr. Sang-Soo Kwak has become the new Editor-in-Chief after me. I believe that his outstanding abilities as a scientist will greatly contribute to the further development of PBR in the future. I am indebted to the Korean Society for Plant Biotechnology and the Asia-Pacific Association of Plant Tissue Culture and Biotechnology (The Association is not currently active, however), which have made the birth of this journal possible, as well as to the Editorial Board members during my editorship. Finally, I would like to thank from the bottom of my heart Professors Yong-Eui Choi and Ju-Kon Kim who served as Managing Editors in earlier and later years, respectively, for their devoted efforts. I am also grateful to the outgoing Editor-in-Chief (Reviews), Professor Yang Do Choi for his service and to the Korean Society for Plant Biotechnology for financial support of this journal. I express my best wishes for the success of Dr. Kwak’s new editorship. 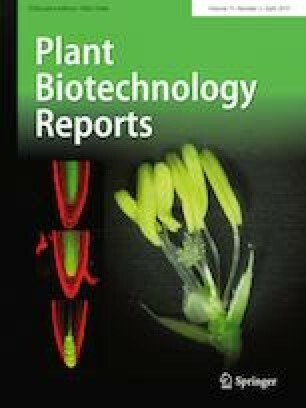 I am very honored to have been appointed to the position of Editor-in-Chief of Plant Biotechnology Reports (PBR) from January 2019. First of all, I would like to give my sincere, heartfelt thanks to Dr. Jang R. Liu for his devoted contributions as Editor-in-Chief for the last 12 years starting with the foundation of PBR. I also would like to express my appreciation to the Managing Editors Professors Yong-Eui Choi and Ju-Kon Kim for their great hard work for the continuous publication of PBR. I will follow the philosophy on which the PBR was founded, as I learned many things not only about science itself but also about their philosophical ideas from the late Professor Atsushi Komamine and Dr. Liu after attending the 1st Asia-Pacific Conference on Plant and Tissue Culture at Daejeon, Korea, in 1993. The dramatic increase in the global population combined with rapid industrialization in developing countries has placed great strains on global food and energy supplies. Plant biotechnology can support solutions to the global problems in a collaborative manner. In this respect, I would like to strengthen the relationship among East Asian countries such as China, Japan, and Korea, because we are in the same boat in terms of food, environment, energy, and health security. For this reason, the Trilateral Research Association of Plant Biotechnology was successfully established in 2016 by the Chinese Society for Plant Biology, the Japanese Society for Plant Cell and Molecular Biology, and the Korean Society for Plant Biotechnology. I am very pleased to invite two Vice Editors-in-Chief, Prof. Peng, Zhang, Institute of Plant Physiology and Ecology, Chinese Academy of Sciences, China; and Prof. Toshiya Muranaka, Osaka University, Japan, on behalf of both the Societies of China and Japan. I will also devote my efforts to increasing the quality of PBR so that it is the outstanding international journal in the field of plant biotechnology. Toward this end, I will focus on increasing the number of original papers and review articles and a faster peer-review system in collaboration with the new Editorial Board members from 12 countries. Finally, I would like to express to all colleagues my hope for their continuous support and collaboration to publish a high-quality PBR.